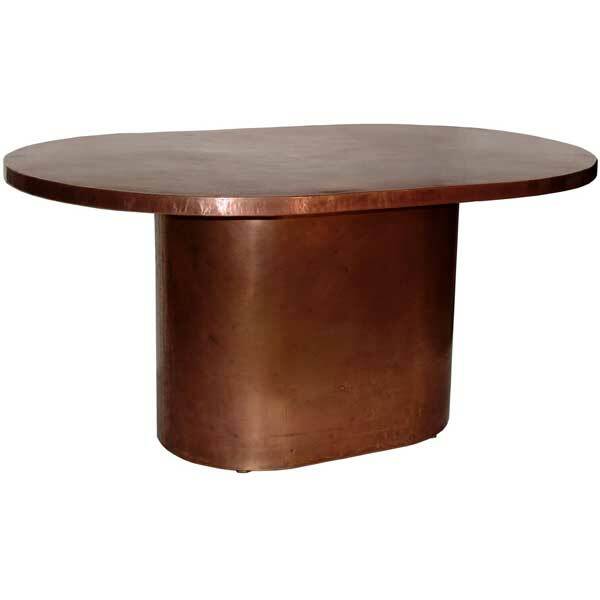 Copper or Brass Racetrack Dining Table. Custom furniture. Copper or Brass Racetrack Dining Table was designed for upscale eclectic homes, restaurants, cafes, brasseries, wine cellars, and bars. With its European style understated elegance, it makes an exceptional copper or brass kitchen table or breakfast table. Constructed of heavy duty 18 gauge (43 mils) copper or brass sheet, this unique table can be made any size up to 96″ wide x 48″ deep, and any height up to 42″. In other words, this table can also be made as a high dining table. The sheet metal is stretched over a robust steel frame and lightly distressed and antiqued. Underside of the table top is coated with sound deadening material. Fancy rivet-head trim is available along the edge of the top by special order. 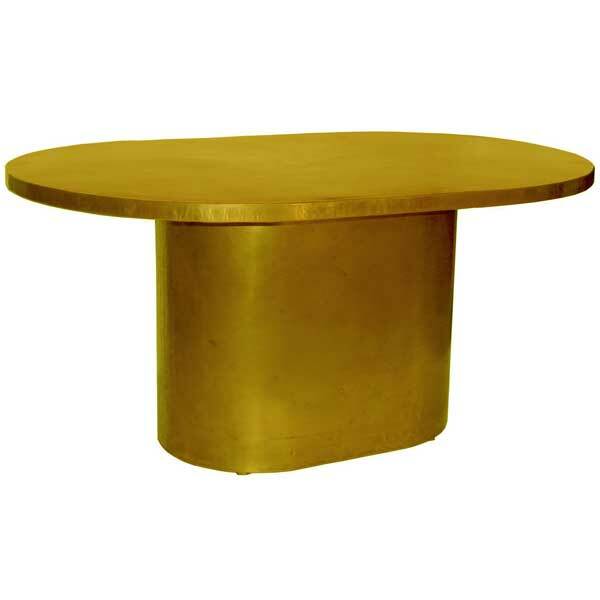 It is perfect for use as a brass or copper restaurant table. Six polished bronze glides are provided which also serve as levelers – a useful feature to have when the floor is uneven. Copper or Brass Racetrack Dining Table was designed by award-winning designer Shah Gilani, ASFD. Custom sizing is available. It may be mentioned here that copper and brass surfaces have intrinsic properties to destroy a wide range of microorganisms. Recent studies have shown that copper alloy surfaces kill E. coli microbes within one to two hours. On stainless steel surfaces the microbes can survive for weeks.